The Blue-headed Vireo is not a common bird in the Piedmont of Virginia and, because it spends its time among the leafy branches of trees catching insects on the trees or in the air, it may be difficult to see even if it is around. Its song is like that of the Red-eyed Vireo, a more common bird, but it sings less often and the series of short phrases is interrupted by more pauses. 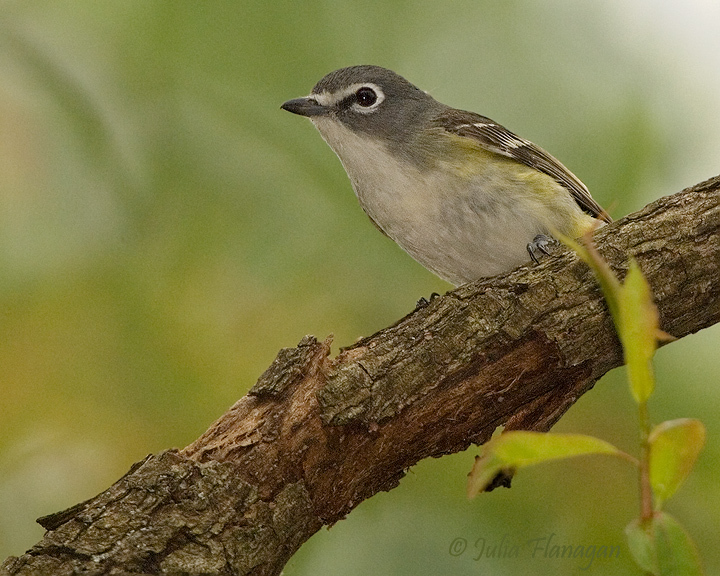 This vireo is a small bird with a blue-gray head, an olive-green back,and darker wings with two white wing bars. Its plumage below is whitish, except on the sides under the wings, where it is yellowish. White rings around its dark eyes are extended toward the bill, giving the bird an appearance of wearing "spectacles". The legs are blue-gray and there is a hooked end to the upper bill. An inhabitant of the northern woodlands of central Canada southeast to New Brunswick and Nova Scotia, of the Upper Peninsula of Michigan, in New England to Pennsylvania and south along the Appalachians, the Blue-headed Vireo migrates south in the fall to spend the winter in the coastal plain forests of the Southern US, eastern Mexico , Central America and Cuba. In the breeding season it eats mostly insects, but will enjoy some berries , particularly when insects are scarce and in its wintering habitat. Its nest is cup-shaped and suspended from a tree branch. Related species that are more common in the eastern United States are clearly distinguished as the Red-eyed Vireo, the White-eyed Vireo and the Yellow-throated Vireo.